Last year, Google announced their plans to the world for creating a service that would deliver all of the most up to date and relevant content about a particular topic from across the web, in real- time, right into your search results. 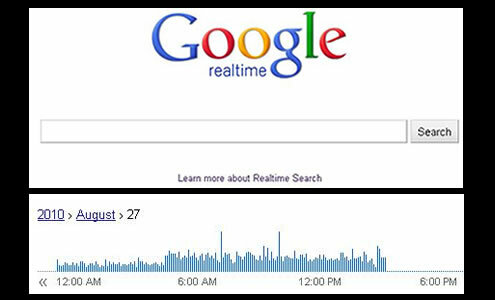 Today, this has become even more of a reality with the launch of Google Realtime. Still in its infancy, it’s currently pulling in mainly Twitter feeds, however, it will ultimately serve up a multitude of social networking feeds, in addition to blog posts. Personally, I’ve never been a huge fan of Twitter so at first I really didn’t see what the big deal was, but the more I’ve read about the service and its uses, the more I am starting to agree that this will have a huge impact on not only the search industry, but on the businesses and marketers that are smart enough to take advantage of it. To begin with, for the first time, with a single search, you have uncensored access to the thoughts and opinions of millions of web users, on popular topics, breaking news, new product launches and anything else you could imagine. Think about all the time you can save by not having to sift through individual posts, blogs, news outlets and regular search results, which as we all know, aren’t always the most up to date. If you’re interested in something in particular that just happened, chances are you’d be able to find a real-time link to a news story to read all about it. Consumer Research: after a major product launch or service development, you could literally see what people were saying and thinking about an offering, providing key insights for what needed to be improved. Competitive Analysis: Searching for competitors and what people are saying about them. If it’s negative, you’d have the perfect opportunity to step in and deliver a solution. Reputation Management: Oftentimes companies are slow to react to criticism and negative feedback. With this tool you’d hear of something as if happened and could have time to create a solution before things became even worse. Local Opportunities: One of the features of Google Realtime is being able to sort your results geographically. Providing the opportunity to gather information and target local prospects. You may wonder with all of this constantly updated content, just how exactly you could keep track of all that was going on without monitoring search results at all times. Well, Google is one step ahead of you… You can create Google Alerts for particular keywords and topics, which will be bundled and emailed to you whenever you like. Google’s blog has a short video, which explains many of the available features.